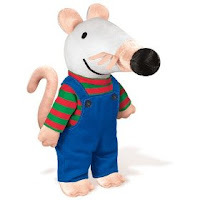 As I mentioned before, we're giving our two year old son the Maisy in Overalls doll for Christmas along with Maisy's Christmas Day . I was of the previous mindset that stuffed characters based on books were completely unnecessary and just added to the stuffed animal pile in ridiculous fashion. However, after seeing how our son latched onto Pooh (who does everything with him) I've since changed my mind. Our son loves reading books about Pooh as a result of his love of his stuffed friend. I have no problems with him liking Maisy because I like Maisy. And if liking Maisy means enjoying some good books then I'm all for that also. I talked about Maisy over at 5 Minutes for Books some time ago. This mouse was a hit in our house. The reason that I find her so appealing and think she is attractive to younger eyes is because of the simplicity of drawing and Lucy Cousin's use of bold colors. Although Maisy is more cartoon-y in appearance, everything is basic and bold making the animals easy to identify. 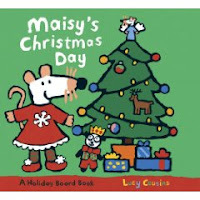 My son will be receiving Maisy's Christmas Day thanks to Candlewick Press. This is a newer Maisy title and children celebrate this fabulous holiday with friends Charlie the Alligator, Eddie Elephant and Cyril Squirrel. They open presents, enjoy food and have fun singing Christmas carols. This board book is a very fun read and is sturdy enough to be around for many Christmases to come. Maisy is fun for toddlers but is also appealing to babies. I tested out some of the Maisy Stroll-Along books for ages 6 months and up on my little nephew. It is my understanding that my sister-in-law clipped these little Maisy books on his stroller and he enjoys looking at Maisy Mouse and friends also. There are very few words on these small board books, but simple concepts are pictured from animals and the noises they make to the ticking of clocks and bedtime. Maisy is friendly and provides something for children to identify with which is also part of the appeal. If you are thinking about a good baby gift, these little Stroll-Along books make a perfect little attachment to a baby shower gift or that last minute stocking stuffer for the little person in your life. Small and compact, they are easy to take along anywhere. My son enjoys them as well although I do insist we must share these particular titles with our cousin. It's all fair. ha. If you haven't made friends with this particular mouse, well, we encourage you to. She's a cheery little thing and we're glad to know her. My twins LOVED Maisy when they were babies until like 3 yrs old. That was 7-10 years ago. Good to know Maisy is still around! Sheesh, you are enabling my obsession CB! Of course NOW I must have Maisy! I have not told you yet, but three of Mike's Christmas gifts are book recommendations by you! Yes, and in the back of my head I am mulling just which book is wrapped by you and sitting in my Christmas present pile!